Capping East Mound in 2008. Photo by Michael Anton, DSNY. 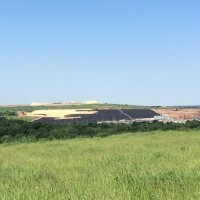 The Fresh Kills Landfill is covered with a landfill cap, which is made of different layers of soil, geotextiles, and a geomembrane. 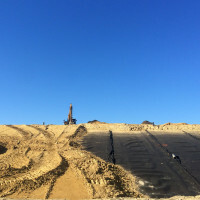 These layers cover and stabilize landfilled waste, separate the waste from the environment and park visitors and prevent the release of landfill gas to the atmosphere. 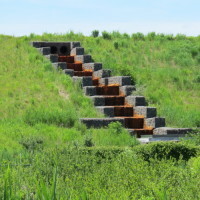 Along with the landfill cap, a collection of swales, down chutes, and retention ponds collect and manage stormwater to prevent erosion to the cap caused by rain water. The New York State Department of Environmental Conservation (NYSDEC) requires a landfill cap be installed on all closed landfills. The final cover is made of a series of layers, each with distinct functions. 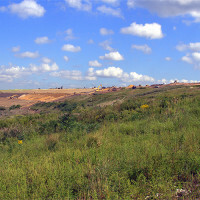 Municipal solid waste was landfilled at Freshkills for 53 years. Naturally occurring clay-like soil at the very bottom of the waste layer helps prevent vertical migration of leachate and waste. The waste itself was covered with layers of soil, on a regular basis, a technique used to create stability within the mounds and to minimize odors. 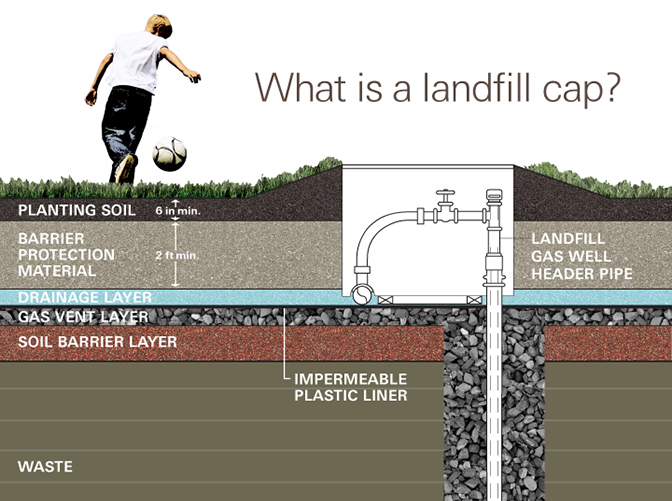 Directly on top of landfilled waste is at least two feet of soil known as the soil barrier layer. This layer covers the garbage and ensures the hills are stable. 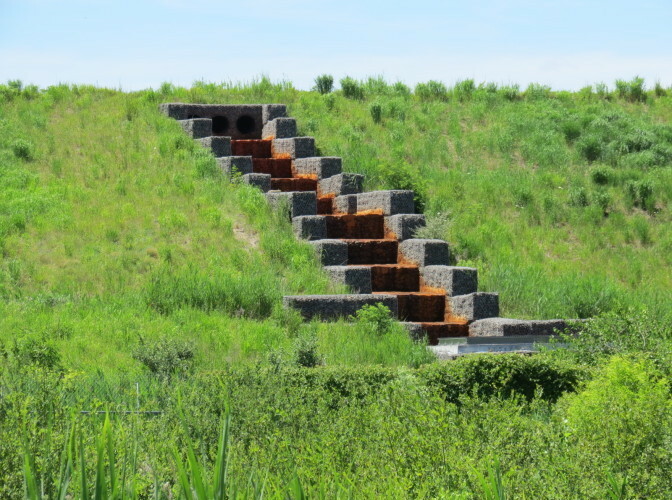 It has varying degrees of thickness so the mounded waste could be shaped into the rolling hills seen at Freshkills Park today. 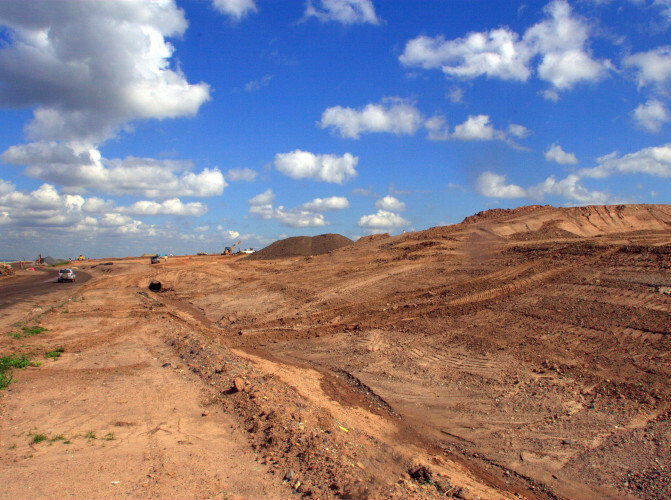 Each hill has been graded to be between 4% and 33% to facilitate storm water drainage. The gas venting layer is a thick geotextile made to promote collection and absorption of gas in soil. This specific type of geotextile consists of two synthetic fabrics heat-bonded to either side of a hard plastic netting. By laying this geotextile over the soil barrier layer, any stray gases moving up through the lower layers will be absorbed by the geotextile. The empty space created by the hard plastic netting allows the particles to move laterally, eventually ending up in the landfill gas collection system. The impermeable plastic liner is a different type of geotextile made from a thin, durable plastic material. Neither water nor gas can move through this layer. It provides separation between the waste layer below and clean soil above as well as preventing the escape of gases upwards into the atmosphere and the migration of rain water downwards into the waste. Tiny micro-spikes along the surface of the impermeable liner help keep the liner from slipping. A geotextile similar to the gas venting layer is used as a drainage layer. It functions the same as the gas venting layer, but in reverse. 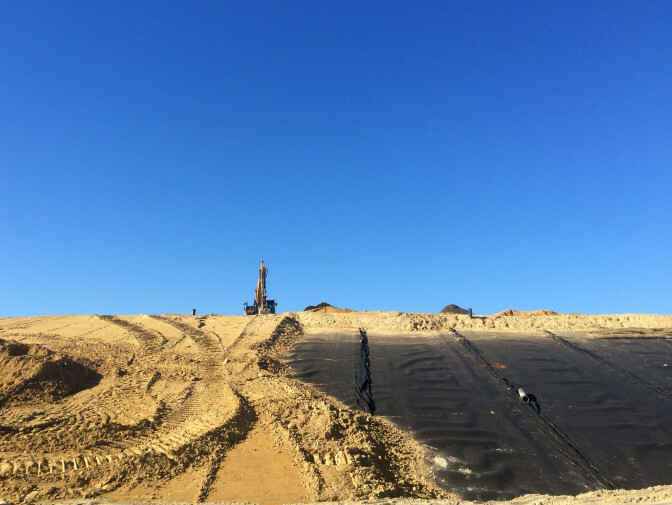 The drainage layer prevents water from traveling downward through the top layers of the landfill cap. Water then moves laterally through the geotextile to the stormwater down chutes and away from mounded waste. The barrier protection material is made of at least two feet of sandy soil placed on top of the drainage layer. This soil protects the geotextiles underneath. Lastly, at least six inches of clean planting soil is spread over the barrier protection material. The soil is seeded with a native plant mix, whose roots help stabilize the mounds and absorb water. 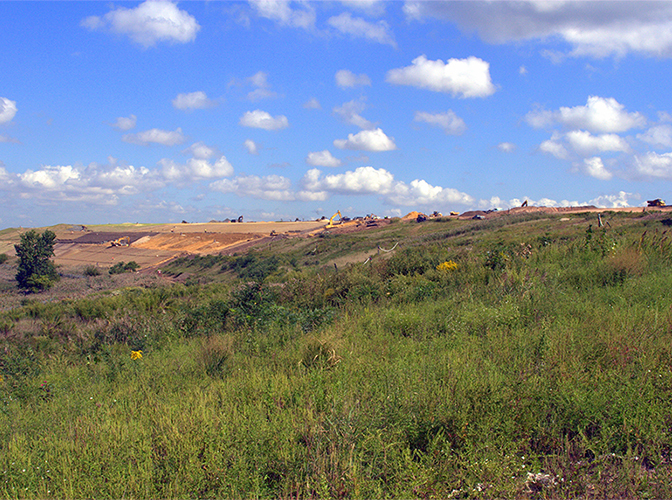 Over time, the landfill subsides as materials break down and gas and leachate are removed from the mounds. 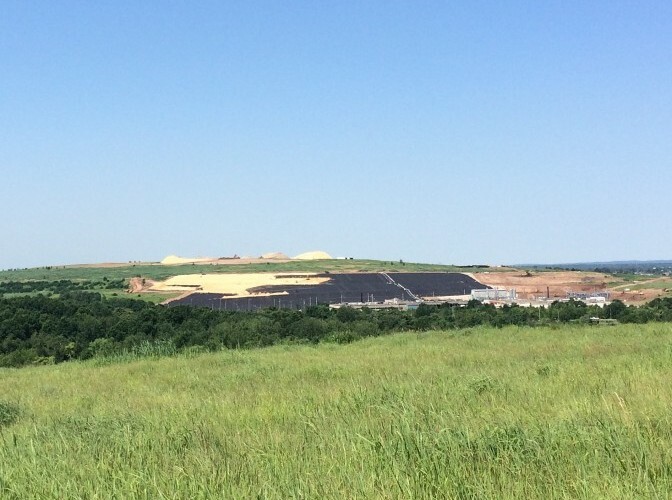 Because of this landfill settlement, the height of the mounds decreases by 10 to 15 percent over time. Approximately half of this settlement will occur in the first five to ten years after the final waste is placed, with further settlement continuing at a decreasing rate for at least another 20 years. Barrier protection material soil over a Drainage Layer and Impermeable Liner. Capping West Mound in 2015. The layers of soil and materials are constructed in phases. Stormwater is collected via a network of stormwater swales, channels, and downchutes which convey the water to holding basins at the base of the mounds. A collection of swales, downchutes, and detention basins move storm water away from the soil layers on the landfill cap. If not managed, storm water could gather in puddles on the hills, eroding the upper layers of the cap. The mounds themselves have slopes graded to facilitate drainage. Swales direct water to down chutes that flow into storm water control basins. Storm water is held in the basins until any sediment settles to the bottom of the pond. The water is then discharged into surrounding waterways.